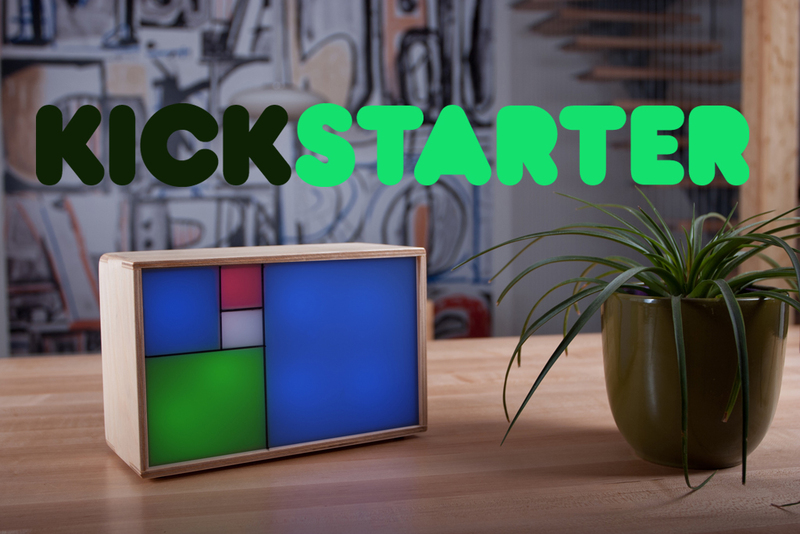 UPDATE: The Fibonacci Clock is now live on Kickstarter! I have 30 days to fund this project … head up to Kickstarter to support me! 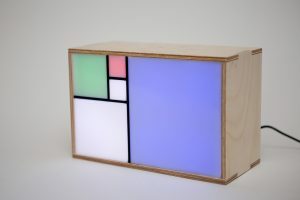 I present to you the Fibonacci Clock, a clock for nerds with style. Beautiful and fun at the same time, the clock uses the famous Fibonacci sequence to display time in a brand new way. How do I tell time? The Fibonacci sequence is a sequence of numbers created by the Italian mathematician Fibonacci in the 13th century. This is a sequence starting with 1 and 1, where each subsequent number is the sum of the previous two. For the clock I used the first 5 terms: 1, 1, 2, 3 and 5. The screen of the clock is made up of five squares whose side lengths match the first five Fibonacci numbers: 1, 1, 2, 3 and 5. The hours are displayed using red and the minutes using green. When a square is used to display both the hours and minutes it turns blue. White squares are ignored. To tell time on the Fibonacci clock you need to do some math. To read the hour, simply add up the corresponding values of the red and blue squares. To read the minutes, do the same with the green and blue squares. The minutes are displayed in 5 minute increments (0 to 12) so you have to multiply your result by 5 to get the actual number. 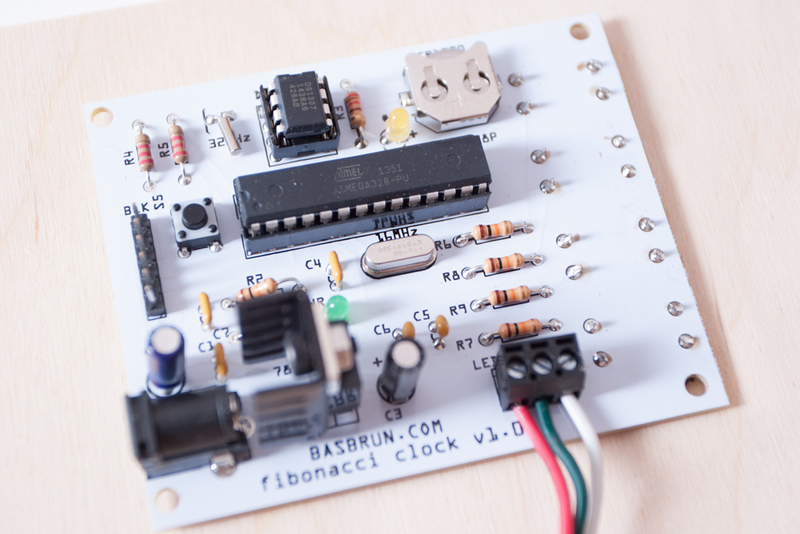 I built the Fibonacci clock using an Atmega328P micro-controller using Arduino. You could buy an Arduino board and a DS1307 real-time clock break-out board and build a custom shield for your circuit but I preferred to build my own circuit board. That allows me to keep size small and price low. The three buttons attached to Arduino pins #3,#4 and #6 are used together to change time. Button on pin #3 can be used alone to change the color palette of the LEDs. An extra button is attached to pin #5 to change between different modes of the clock. Two modes are lamp modes and the default mode is the clock. All buttons are connected to the Arduino pins with a 10K pull-down resistor in parallel. The real-time clock chip DS1307 is connected to the Arduino analog pins 4 and 5 with two 2.2K pull-up resistors. The clock pin 5 (SDA) is connected to the Atmega328P pin 27 (Arduino A4) and the clock pin 6 (SCL) is connected to the Atmega329P pin 29 (Arduino A5). To keep time while unplugged the DS1307 chip needs a 3V battery connected to pint 3 and 4 of the chip. Finally, the real-time clock is driven by a 32KHz crystal connected on pins 1 and 2. A 5V power is applied on pin 8. I am using LED pixels built on top of the WS2811 drivers. These microcontrollers allows me to set the color of each individual LED with a single output on the Arduino microcontroller. The Arduino pin used to control the LEDs in this project is pin #8 (Atmega328P pin #14). You will find all the details on how to connect the Atmega328P to make an Arduino clone on my post “Build an Arduino Clone“. I added a new feature in this project, an FTDI port to program your Arduino microcontroller directly on this circuit. You connect pin one to the reset pin of the Arduino trough a 0.1uF capacitor to synchronize your uploader with the chip bootup sequence. Pin 2 (RX) of the FTDI port connects to pin 3 of the Atmega328P(Arduino 1-TX) and pin 3 (TX) of the FTDI connector connects to pin 2 of the Atmega328P (Arduino 0 – RX). Finally FTDI pin 4 goes to 5V and 5 and 6 to ground. The following video presents all the steps for the construction of the Fibonacci clock enclosure. 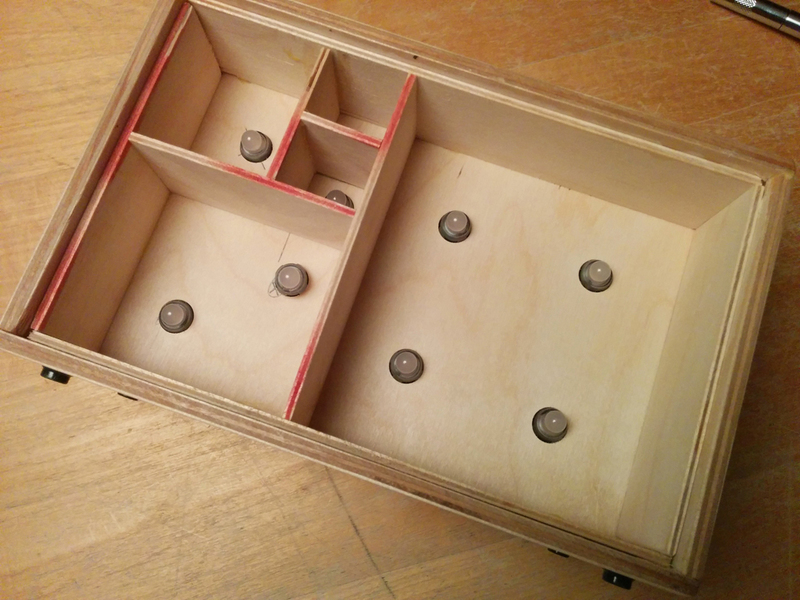 The idea is to create 5 square compartments in the clock, two inches deep, matching the size of the five first terms of the Fibonacci sequence, 1, 1, 2, 3 and 5. The LEDs are distributed in all squares and connected in the back of the clock to the circuit board. 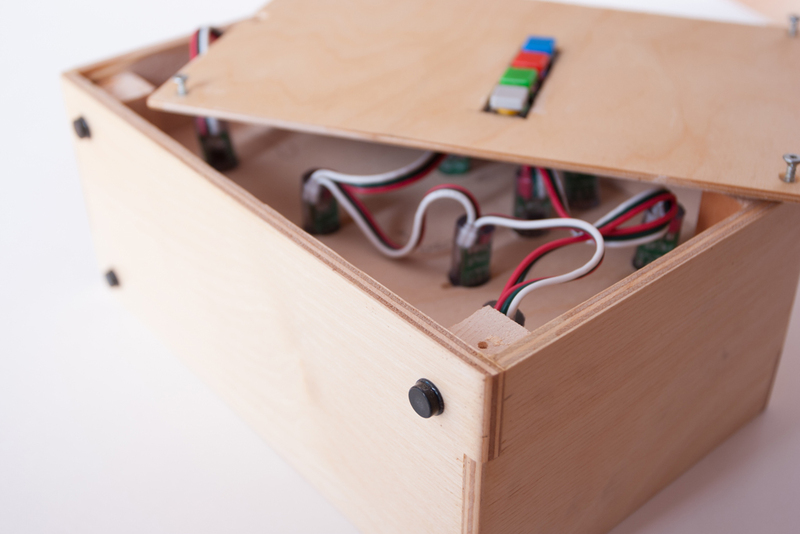 The enclosure is built out of birch plywood. The frame is 1/4″ thick and the back panel is 1/8″ thick. The separators are 1/16″ thick and can be made of any opaque material. The dimensions of the clock are 8″x5″x4″. The front of the clock is a piece of 1/8″ thick semi-transparent plexiglass. The separators are marked using a Sharpie pen. The wood finish is a water based varnish applied after a good sanding using 220 sand paper. There are 5 different color palettes built in the clock. The default RGB mode, a Mondrian mode with red, blue and yellow and some more contemporary color palettes I would not be able to name! 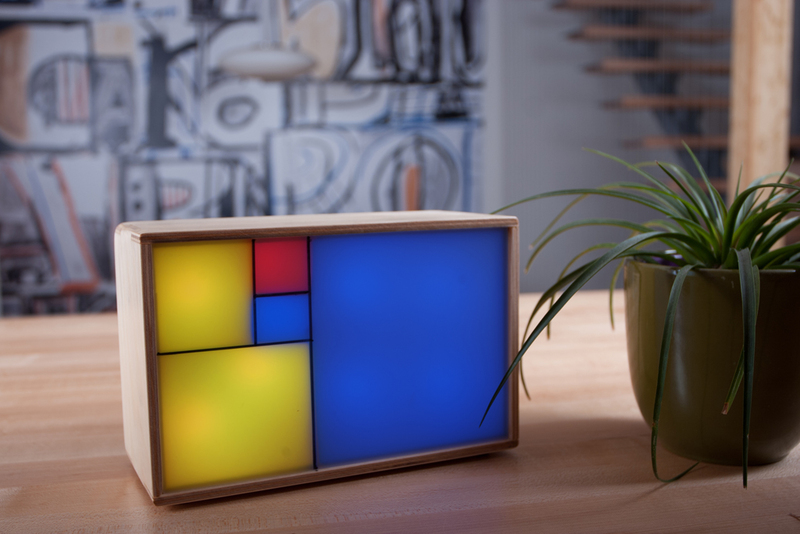 The Fibonacci clock can also be converted into an ambiant lamp! The code published already support two lamp modes. Simply push the mode button to toggle between the three modes. The code is open for you to hack, feel free to implement your own modes! How did you go about getting that custom PCB made? that is something I’ve always wanted to do but never could get a simplified (and cheap) answer. I uses Fritzing to design the circuit. This is an open source software perfect for small projects like this one. To print the pcb I used one of the suppliers you can find on PCBShopper, a web app that will find best places to produce your PCB. Phil…heard the interview on cbc this morning and would like you to come speak to the montreal group for 40 minutes.Check us out at Tiger21.com. There are many ‘clock’ projects out there and I rarely care for them, but this one is clever and pretty. Pretty enough to excuse the lack of practicality (and since we all have multiple clocks, we don’t need a practical clock). Well done! If you make it a construction kit, i might buy one. Thanks for your comment, it’s very much appreciated! I will be selling these clocks after I fulfilled all my Kickstarter pledges. I’ll post an update here and on Kickstarter when pre-orders are available. Really beautiful, looking forward to mine! Yes, I have some friends interested in coding the thing! I’ll post updates here about their project. The FTDI port is used to reprogram the microcontroller withour having to remove the chip and place it on an Arduino board. Votre création est extrêmement bien réussie et mon épouse a été immédiatement emballée. Mes enfants vous en commanderont surement lorsqu’ils l’auront vue. Bravo! Questions 1) Quelles pièces de remplacement devrais-je commander pour que le systeme dure looooongtemps? 2) Je ne suis pas un ”geek” mais j’aimerais savoir si l’on peut réduire la vitesse des changements de couleurs lorsqu’on utilise le boitier comme lampe. Peut-on acheter une piece additionnelle? Qui peut faire cette adaptation? Merci encore pour ses instants de plaisir. Une suggestion. Pourquoi ne pas faire la version lampe seulement et la vendre moins cher. Vous auriez je le crois un tres grand succes dans les grandes surfaces. Merci pour vos commentaires! Vous ne devriez pas avoir à acheter de pièses pour plusieurs milliers d’heures! La pile à l’intérieur devrait durer quelques années et il est très facile d’en retrouver sur le marché. Les lumières elles sont plus difficile à trouver et peuvent être achetées sur mon site à http://store.basbrun.com. Il n’y a cependant pas d’urgence car elles ne devraient pas “brûler” avant quelques années elles aussi. Pour la vitesse de changement des couleurs il faudrait changer le code à l’intérieur de l’horloge. Je vais bientôt écrire un article sur cette technique ici sur mon blogue. Vous pouvez joinder ma liste de courriels pour être avisé quand je publie un article. what pretty project. When i look at your board there are two ideas. Instead of 3 V battery it is possible to make it with a goldcab super capacitor (it is 4 of 1N4148, 0,047 µ goldcab and 2 resistors (910 Ohm and 4,7 kOhm). So you never have to change a battery – goldcab never needs support. The case of the crystall for the DS1307 should be grounded (see data sheet), i think this is because of sometimes bad power supplies. Thank you for your great input! This is much appreciated! The idea of the battery was to make sure I could preset the clock for my clients and not worry about them not plugging it on reception. How long do you think this capacitor could hold on? I didn’t know about the case having to be grounded! I’ll look forward to that. i do the goldcab things for wordclock project (Arduino Atmega 328-p-pu and ds 1307^^) and i let it away from power for more than 2 weeks and still time is correct there… (so mayby time is 3 or 4 or more weeks still there) DS 1307 does not need much power… if you whish i send you a assembld pcb for your own tests (of course for free – we are all builders). Salut je suis de Trois-Rivières… Puis-je passer à Montréal chercher une horloge tout assemblée et prêt pour l’achat ? Au courant la semaine qui vient … 1 au 4 juin ? Merci d’avance. Merci pour votre message! Les horloges assemblées ne seront pas prêtes avant le mois d’août. De plus, je me dois de fabriquer et envoyer les horloges et kits à tous ceux qui ont appuyé mon projet sur Kickstarter avant de les vendres à l’extérieur de leur plateforme. Ok… Mais est-ce possible pour une non assemblée ? I’m a huge fan of your fibonacci clock and I wanted to purchase a DIY kit from you, however I missed the kickstarter reward for that by a day! I was just wondering if you still had the Fritzing .fzz file that has the schematics for the circuit board lying around, and possibly if I could have a copy to try and build a clock myself! You can still buy the 75$ DIY kit on Kickstarter for an other 40 hours! I will publish all the schematics at the end of the Kickstarter campaign! I’ll post the schematics in a couple of days … Still have to clean the Fritzing file. You I2C pull-up resistors seem like over kill at 22K. Your schematic shows 2.2K resistors? I am confused as to which they are? Also if your using 5V logic which from your schematic your it would seem the pull-up resistors would be 4.7K. My bad, that’s a typo! It’s actually 2.2K. Thanks for the hint, just fixed it! Can I use Led pixels strip driver IC INK1003 instead of WS2811? Which driver IC can you use to replace WS2811? I’m using the WS2811 because the libraries for Arduino are solid and well maintained. You can use any LED controller but I don’t know much about the different libraries available. Just got my clock this weekend. Thanks its fabulous. I’m glad you like it! Would love to see a picture of the clock in it’s new home! This clock is beautiful! I’ve had it setup for about a week now and it makes me smile every time I see it. The colors are great and it give me a periodic math geek diversion. Hoping your partner will love the clock! I have been reading alot about woodworking when I came across steve Ramsey on Youtube. I think he made your clock and I thought its amazing! So I am very interested in buying a pre-soldered kit…. Only problem is I’m living in Germany, do you have these available for shipping if “yes”, what speed/costs are likely to be incurred or do you have any 3rd party suppliers that which can send to either the UK or Germany? Thanks for your comment! You can get a kit on my store at http://store.basbrun.com. I ship worldwide and shipping to UK or Germany takes between 5 and 10 business days. What is the shipping time in US. Do you think I will get it for Christmas? Sorry for the delay, I don’t read these messages often! I see you already ordered your clock…It shipped this afternoon and UPS estimate the time of delivery for the 22nd … Let’s say 23rd to be on the safe side. Should be good for Christmas! Thanks for supporting this weird project of mine! Easy to set up, and it’s in pride of place mantlepiece. Unfortunately these fees are being charged by your government, not me. I apologize for any inconvenience, but I have no control over the customs authorities in the UK or any other of the 40+ countries. Yes, I will add a note on my site for international buyers. i’m from china. i love it very much last year since i know it. but i see your web until today. i want to have it(fibonacci clock). Could i buy it? (It’s my first time shopping aboard). i’m very excited to send this message. Looking forward to your reply. Why did you choose not to display 12 hours from 12:00 to 12:59? Red and blue are more appealing to me than White and green. Has anyone offered the code to do this? If you modified your design using my source code that I used to make a Windows executable application and screensaver, your clock would have a wider appeal and be much easier to read.